My Revolution. Saving bees in Central London. From supporting research into Colony Collapse Disorder, through distributing wildflower seeds to customers and its own farmers alike, to providing direct funding and support for amateur beekeepers, this initiative always looked like a major step beyond your average corporate outreach effort. The video below would seem to confirm this, visiting urban beekeepers who have directly benefited from the Cooperative Group’s support. By sealing up cells full of contaminated pollen, bees appear to be attempting to protect the rest of the hive. Honeybees are taking emergency measures to protect their hives from pesticides, in an extraordinary example of the natural world adapting swiftly to our depredations, according to a prominent bee expert. Scientists have found numerous examples of a new phenomenon –bees “entombing” or sealing up hive cells full of pollen to put them out of use, and protect the rest of the hive from their contents. 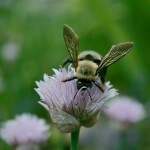 The pollen stored in the sealed-up cells has been found to contain dramatically higher levels of pesticides and other potentially harmful chemicals than the pollen stored in neighboring cells, which is used to feed growing young bees. Bees naturally collect from plants a substance known as propolis, a sort of sticky resin with natural anti-bacterial and anti-fungal qualities. It is used by bees to line the walls of their hives, and to seal off unwanted or dangerous substances – for instance, mice that find their way into hives and die are often found covered in propolis. This is the substance bees are using to entomb the cells. Bees just want to be bees. I’ve learned recently that, like most things in nature, a honeybee colony is most happy, calm and resilient when it’s left to do what it does best. For bees, this means forage for nectar and pollen, raise a brood, and make honey. And bees want to do this in their own time, on their own schedule, and with the freedom to respond to each unique season. 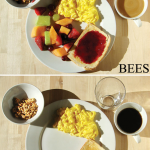 Which is quite contrary to how we currently manage bees. So what’s going on here? Our species’ treatment of the honeybee is a striking metaphor for our wider relationship with nature. In short, we started out okay, with a suitable amount of reverence, and then we progressively sought to bend the way of the bee to our wishes, convenience and ultimately, gross profit at the expense of all else. The result of this treatment has pushed the honeybee (a primary pollinator of most things we eat) to the point of collapse, and now we’re wondering what went wrong and how the heck to fix it. Sound familiar? …a bee colony is a finely tuned super-organism with about 40 million years of evolutionary backup. Bees have been refining what they do for a bloody long time, and they’ve got things pretty much sorted. Understanding how they operate in a completely natural system is a good starting point for understanding their needs. So natural beekeeping (as opposed to not-quite-as-bad-as-conventional beekeeping, sometimes called by the same name) is all about letting bees be bees, and harvesting surplus honey when it is available. In the meantime, you get fantastic fertility from having so many pollinators around, and you’re creating resilient colonies which are disease resistant.